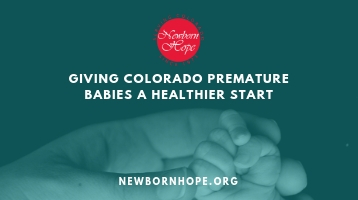 NEWBORN HOPE, INC. provides resources for Colorado premature babies and families impacted by prematurity. Funds target programs related to prematurity prevention; equipment for care of the premature neonate; neonatal research; maternal, prenatal, and neonatal care for the medically underserved. Newborn Hope, Inc. kindly requests that all Grant Applications be limited to a maximum dollar amount of $10,000 per request.